Gail (Charlotte Sullivan) and Holly (Aliyah O’Brien) – the beginning of something special? This week on “Rookie Blue,” everyone at 15 Division is just trying to get through the day’s shift, because Frank and Noelle are getting married tonight! And to be honest, I was feeling much the same way throughout the episode. Let’s get this crime solved, shall we – so we can see what happens with everyone’s lives at the wedding! It doesn’t seem like much at first glance: a tour bus is stalled in an underpass. Nick and Andy arrive, only to discover the bus is full of casino-bound senior citizens who’ve just had all their money and valuables stolen by the driver of the tour bus. The race is on to find the perpetrator before the wedding. It soon becomes apparent it’s an inside job. Someone cancelled the original tour bus, which the manager of the seniors’ home books annually. That someone showed up in a different company’s tour bus, stopped under the underpass, pulled a stocking over his head and robbed all the passengers, beating up a few of them along the way. Nick notices something interesting when they finally finish their inventory of the items stolen. Everyone had their wedding rings taken, except for one elderly couple. When the husband is questioned, he admits to arranging for a nephew to pull off the job, only the nephew, who wasn’t supposed to hurt anyone, double-crossed him. With the case solved, everyone gets to go off shift to prepare for the wedding, except for Nick and Andy. The nephew works at a construction site. They arrive to find him 70 feet up in the air; the foreman tells them the man’s fixing something, some safety issue, so they’ll have to wait until he comes down. Poor Andy – she’s been so excited about the wedding, but first she and Nick have to wait until the suspect comes down so they can arrest him. Meanwhile, Traci’s being escorted around town by Steve Peck, Gail’s brother, handling all the last minute wedding stuff – she’s the maid of honor, her car broke down, and Steve offered to take a personal day and chauffeur her around (what ho! you say? Yes, we noticed this one coming a mile away a few episodes ago, didn’t we?). And soon Traci has a potential wedding disaster on her hands: Noelle’s gone missing. Traci and Steve find Noelle at her house, packing a bag. Noelle can’t go through with the wedding; she just found a suspicious lump in her breast, the biopsy hasn’t come back yet, but it’s not a lump that looks innocent. Noelle’s mother died of cancer, and Noelle’s sister died of cancer. What Noelle knows for sure is she doesn’t want Frank to marry her with that over her head; she already thinks he got pressured into marrying her because of the baby. She doesn’t want him to end up with a sick and dying wife into the bargain. Luckily Noelle changes her mind on her way to the airport, thanks in part to a partially nonsensical verbal flood on Steve’s part. She’ll at least go to the hotel and tell Frank in person that she can’t marry him. Earlier that day, Oliver tells Dov he’s not going to the wedding. Zoe, his ex-wife, is going to be there, with her new boyfriend, and even though Frank’s one of his best friends, there’s no way he’s going to go and expose himself to the humiliation of seeing her there. Dov says, no way, you’re going, and you’re going to show Zoe just how much she’s lost. He grabs Oliver’s phone, dials a number and hands the phone to Oliver. Oliver takes the phone, only to find it’s Celery. Remember Celery, the witch from the previous episode? He falteringly asks her if she’d come to the wedding with him – and she says yes! Yay, Oliver! (It’s about time!) There are some fun bits at the station where Dov gets one of the senior citizen victims to call his tailor to the station to fit Oliver for a suit. The senior also lends Oliver one of his snazzy cars for the night. And Gail decides to ask Holly, the forensic pathologist, to be her “plus one” at the wedding! Last episode I wondered if something between these two might be a possibility, and it looks like the answer to that is “yes”! I’m so glad; I love the way Holly is with Gail and I think she’s the kind of person Gail really needs right now. Noelle confesses all to Frank, who tells her he wants to be there with her, no matter what. A very, very sweet moment. The wedding’s back on! Oliver (Matt Gordon) and Celery (Emily Hampshire): it’s about time, Oliver! 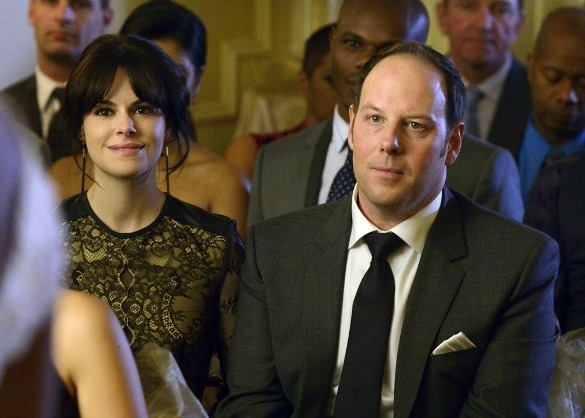 At the wedding, it turns out Oliver’s ex – Zoe – is there all on her own: she and her boyfriend broke it off a few days ago. Celery goes off to fetch drinks for herself and Oliver while the bride and groom are dancing their first dance; that’s when Zoe wanders over to Oliver. Celery sees them, and hands Oliver his drink, telling him she’ll be going. And Oliver, smart man that he is, leaves his ex immediately to go talk to Celery, who tells him, I think you have some things you have to figure out first. And Oliver looks her right in the eyes and says, no, I have absolutely nothing to figure out. Except how to get the most beautiful woman in the room to dance with me. Traci and Steve are over at the desserts table, bonding some more over cake lollipops. You can tell Steve’s fallen for her, but Traci’s more of an enigma. It’s so soon after Jerry’s death. Is it too soon for Traci? And meanwhile, Gail and Holly are sitting on the floor of the cloakroom, drinking and talking. Gail’s asking her all sorts of questions about how a relationship between two girls actually works. Like, do you share clothes? And Holly laughs and says, I wouldn’t share your things. Gail demands, what’s wrong with my things? And Holly says, “Nothing, they’re just not my style.” Gail sputters at this, but then Holly leans over and kisses her before getting up and telling Gail, this has been a really fun plus-one. Holly leaves, and Gail is left sitting on the floor staring after her. The plot is definitely thickening when it comes to this relationship! Last but not least, Andy and Nick arrive at the wedding at last. Standing in the doorway to the room, Andy tells Nick she needs time, and Nick tells her he’s not going anywhere. And the whole time, Sam’s at the bar, watching the two of them. So it looks like Andy’s back in the two-men-in-her-life situation, only this time instead of it being Sam and Luke, it’s now Sam and Nick. And I’m so glad Gail might be embarking on a totally new relationship – it would be too brutal if she had to stick around all on her lonesome to watch whatever’s happening with Andy unfolding. And Oliver’s dating a witch! I love this show. I’ve watched Gregory Smith since he played Mel Gibson’s little son on The Patriot and then onto Everwood and now Rookie Blue. The cast has a great dynamic – glad someone’s doing recaps on this!